Stewart Baird was jailed at Hamilton Sheriff Court. 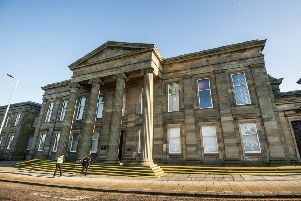 A fraudster who conned a Newarthill family out of £2,000 after promising to carry out work at their home has been jailed for nearly two years. Stewart Baird advertised gardening, fencing and decking services on Facebook, but customers were left out of pocket after he demanded money up front then made a string of excuses for not starting the job. Baird (31), a prisoner, admitted a fraud charge and a breach of consumer legislation when he appeared at Hamilton Sheriff Court. The court heard the customers in Pickerstonhill, Newarthill, arranged for him to carry out fencing and patio work costing £2,700 in July this year. Baird said he needed £2,000 up front to pay for materials and was given this sum via a bank transfer. However, the work never started as, over the next few weeks, he made various excuses, claiming at one point that the materials he bought had been stolen. Baird eventually agreed to repay the £2,000, but this didn’t happen and the police were called in. Sheriff John Miller jailed him for a year and 10 months and said Baird’s early guilty plea had saved him from a two and a half-year stretch. More from the court in the Times & Speaker, out on Wednesday.